There’s something special about motorcycle travel in the fall. Cool temperatures and fantastic color shows make for memorable rides that can sustain motorcycle souls through the cold winter months ahead. With this in mind, I set out on an 800-mile backcountry tour of Idaho where the scenery promised to be just as enthralling as the terrain in the fall season. Most motorcyclists tend to think of summer as the premier riding season, and I think fall is often overlooked. Granted, it’s a much shorter season, and the days aren’t quite as long, but the riding can far surpass that of summer. The temperatures and conditions are much more pleasant, and in most places the countryside is literally exploding with color. Inclement weather can be a deterrent for some, when really, a little bit of rain and cooler temperatures can be the perfect storm for riding conditions. To say that fall weather in Idaho is temperamental would be a drastic understatement. Shoulder season conditions can be phenomenal, but they can also quickly remind you that winter is approaching. This is especially true when traveling into the high country where the cool affirmation of winter is always in the air. Weather can vary drastically, cold and clear in the morning, warm and sunny midday, freezing rain in the afternoon and then back to clear and cool again in the evening. Moody weather systems paled in comparison to the awe-inspiring beauty of Idaho’s backcountry. With so much open space and unspoiled wilderness, it made it the ideal outdoor playground and the perfect place to take in all the glory of the season. Fast-moving weather systems did nothing to deter my experience and actually helped me to appreciate the mostly ideal climate. Cresting Pinion Pass outside of Stanley, Idaho, I got the distinct feeling that my friend and I were the last patrons of a carnival that was closing its gates for the season. Without another soul for miles the Sawtooth Range felt like our own private mountain range. A shameless gear junky, avid adventurer and constant explorer. 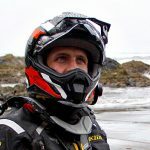 With a passion for motorcycles, overland travel, the great outdoors and all things mechanical he is right at home in the adventure motorcycle community.